Newspaper stories are often used to misleading effect in political ads, but a new one-minute ad from New York City comptroller candidate Eliot Spitzer puts a twist on the theme by actually doctoring a New York Times headline. It’s a classic case of what those in the Twitterverse call a #humblebrag. 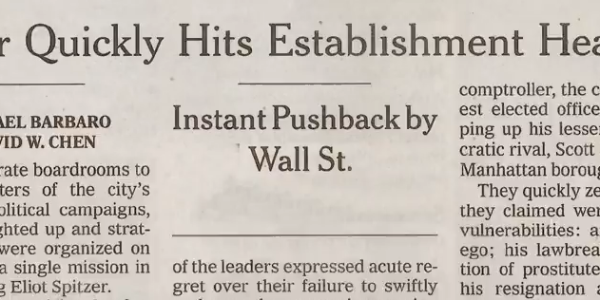 In other words, it’s seen as a positive to be “hated” by Wall Street. So why the doctoring of the headline? One has to assume the campaign was less thrilled about negative reviews of Spitzer from Democratic-aligned unions and Democratic politicians. 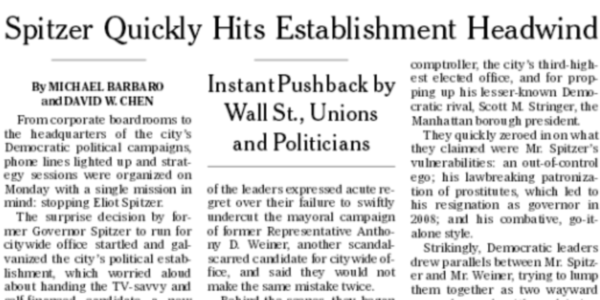 The New York Times article quotes Democratic leaders, such as City Council Speaker Christine C. Quinn, a Democratic candidate for mayor, and Michael Mulgrew, president of the United Federation of Teachers. The article quotes Mulgrew as saying, “We’re going to make sure that we do everything in our power to make sure Scott is the next comptroller,” referring to Spitzer’s Democratic rival, Scott Stringer. That may be, but the response ignores entirely the issue of digitally altering (or cutting and pasting, or whatever method was used). We’ve seen distortions of media reports in political ads plenty of times before. Often a campaign will attempt to trade on the credibility of a news organization to bolster its candidate, but fail to disclose that the information used in the ad comes from a partisan source rather than the newspaper itself. We’ve seen cases in which ad-makers have cited a figure as coming from a respected newspaper, but failed to mention that the newspaper was simply reprinting an excerpt from the book of a partisan author. We’ve even seen cases in which an ad shows only part of a headline to mask that the information came from an advocate. But we couldn’t recall an instance in which a headline had actually been altered like this one. The headline in the Spitzer ad was shown for just a quick second (although the ad also flashes a zoom-in on the doctored subhead). But it is deceptive, plain and simple, and we point it out in hopes that it doesn’t become a growing trend in political advertising.